Transition lenses due to its properties are part of the UV sun protection lenses. They are known as transition, due to reputation of a company that produces them, but the real name for lenses with such properties is photochromic lenses. A sunscreen colored lens is characterized by the fact, it has a simple coloration between 10% and 85% that remains the same regardless of light intensity. 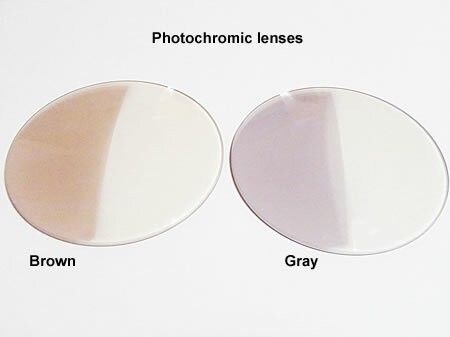 For example, a lens coloration of 85% is suitable for strong sunlight. But what if it gets cloudy or the night comes? Lens will be too dark for normal vision so glasses will be inadequate and even disturbing. For this reason appeared the transition lenses that have property to change their color, depending on light intensity. If you are home, the lenses are transparent white. Outside if is cloudy they have a coloration between 20%-60% and then coloring reaches up to 80% if sunlight is strong. So you have different colors for different intensities of light in a single lens. The length of time the lens goes from 10% to 85% coloration in bright sunlight is about 30 seconds, instead reverse, from 80% to 10% it takes a few minutes. I have to admit that photochromic glasses are the most successful innovation in this field of UV eye protection, a hugely appreciated innovation in our store. This is a foil on the lens and because of its high resistance and quality is the most popular and often used (ex. Transition lenses). The only disadvantage is that, after a few years, its photochromic proprieties will decrease and will be less efficient and attractive. Here, the photochromic part is the lens itself, which is molded with these properties. This technology is used for high index lenses. This keep them thin after different proprieties are added. The advantage is that, in time, they don't reduce their proprieties. As the material, they can be made of glass, plastic, polycarbonate. Personally, I like transition lenses, I wear a pair of such eyeglasses, and I'm pleased with them. If you are a person sensitive to sunlight and wearing glasses for vision correction, I can not think of a better option than this type of lens that changes color, depending on daylight intensity.